Learn more about Optris‘ infrared temperature measurement devices and their setup, properties and special features. 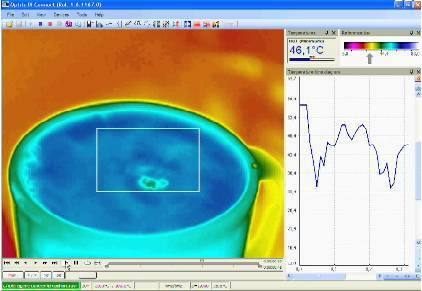 Find numerous thermal recordings of the optris PI infrared camera series, e.g. our range of color paletts or the purpose of aerial thermography recordings. Our optris PI infrared cameras score with a high image quality as well as numerous analysis options. See for yourself! Would you like to know how our ratio pyrometer or the popular thermal imager optris PI 160 work? This is your section, then. Learn more in our product videos showing you the wide application ranges of your optris temperature measurement device. Are you interested in how infrared temperature measurements work? Do you need instructions in connecting your thermometer to a Siemens SPS? Our training videos show you how it's done - quick and easy. For further information as well as additional criteria to decide on the fitting measurement device for your individual applications, see our product brocure and articles on different fields of application. Naturally, we take personal care of your inquiries: Our application engineers not only help you with your inquiries, but also after your purchase.